The pace of the European solar photovoltaic (PV) market in the first half of 2010 was dominated by the impending mid-year incentive tariff reductions in Germany and conditioned by the lower module pricing that emerged through 2009, according to the latest from Solarbuzz® in Europe PV Markets 2010. Looking back at 2009, the German PV market reached 3.87 GW, growth of 109%. The growth would have been even larger if not for a shortage of inverters that has curbed the market since September 2009. The largest customer segments in 2009 were Investor Groups (42% of the on-grid market), Agricultural (18%) and Commercial (14%), with Utility and Government customers playing a smaller role. Private residential PV systems accounted for 13% of the market. With 770 MW newly installed capacity, Italy became the world’s second largest PV market. 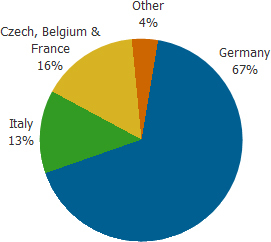 The Czech Republic, France and Belgium combined to add 933 MW of newly installed capacity in 2009. Growth of the total European market was just 16% in 2009, while growth excluding Spain was a remarkable 126%. This highlights the vulnerability of the overall market to policy review in the larger markets balanced against the growth of emerging markets. The PV industry has gone from boom to bust and back to boom within a cycle of less than two years from the downturn in Spain late in 2008 to the current surge in Germany. On that basis, few would project stability over the next five years. The fundamental problem is the continued dependence of the industry on market incentives. Increasingly, their cost is becoming a “political hot potato” when programs overshoot their planned scale. The specter of further cutbacks in incentive levels in major markets now hangs over the PV industry some 21 months on from the start of the debacle that has turned the Spanish market from leader to laggard. The macro economic climate has also changed markedly over that period. The banking crisis that coincided with the Spanish PV market downturn has turned into a broader economic malaise. Current forecasts indicate the new mechanism of tariff adjustment in Germany will be effective over the 2011-2012 period in subduing the German market. Despite this there remains upside potential in 2011, especially in the most aggressive pricing environment of the Solarbuzz Production-Led scenario. The European outlook of tightening policy as governments seek to reduce the economic burden of their national incentive programs will sustain pressure for continued price reduction beyond the short-term tightening around mid-2010. Solarbuzz Europe PV Markets 2010 provides detailed review of Europe’s 2009 PV market and a five-year forecast. It provides analysis on major countries including Germany, Spain, Italy, Belgium, Bulgaria, Czech Republic, France, Greece and Portugal including market segmentation, government policies, downstream acquisitions, project-by-project listings, investment economics, downstream market pricing and market forecasts. With data analysis into country specific PV market segments, this report is critical for sales and marketing decision making for PV companies, equipment manufacturers, materials suppliers and PV systems integrators who want to succeed in Europe’s PV market. The 2010 Solarbuzz regional reports (Asia and Pacific Major PV Markets 2010, Europe PV Markets 2010 and United States PV Market 2010) are now available—bringing clarity to this complex sales and market environment. Featuring more than 300 pages for each region, they focus on the key downstream sales and marketing agenda—helping to resolve the market challenges and identify the future sales opportunities. Report content addresses market segmentation, detailed review of PV incentive policies, PV project listings by segment (government, corporate and utility customers), downstream channel structure and volumes, financiers and PPA providers and terms, regional economics, downstream company activity and installed PV system pricing—concluding with a focus on the future via five-year market forecasts together with identification of short-term project-by-project order books. To order Solarbuzz regional reports, contact us at our nine global locations, email us at admin@solarbuzz.com, or call 1.415.928.9743. The NPD Group is the leading provider of reliable and comprehensive consumer and retail information for a wide range of industries. Today, more than 1,800 manufacturers, retailers, and service companies rely on NPD to help them drive critical business decisions at the global, national, and local market levels. NPD helps our clients to identify new business opportunities and guide product development, marketing, sales, merchandising, and other functions. Information is available for the following industry sectors: automotive, beauty, commercial technology, consumer technology, entertainment, fashion, food and beverage, foodservice, home, office supplies, software, sports, toys, and wireless. For more information, contact us or visit http://www.npd.com/ and http://www.npdgroupblog.com/. Follow us on Twitter at @npdtech and @npdgroup.